My back stings from a sunburn. My arms creak, my eyes sting. I have scabs up and down my legs from itching my bug bites too much. My shoes are soaking wet and I have dirt in my hair. And… my cheeks ache from smiling. I am incredibly happy. Being the Youth Peace Advocate, this week and every week, has brought me so much joy! Sure, I feel the skin peeling off my back and I’ve had about 40 gnats fly into my eyes, but I wouldn’t want to miss a moment of it. Yesterday, a boy asked me what my favorite color was. When I said “orange,” he smiled, took off his bracelet, and put it on my wrist. Every day, I have 10 kids running up to hug me. I have been on the receiving end of so much generosity and kindness this summer, it’s kind of hard to believe. The amount of love I have been shown could outshine the sun. “Hi, I’m Laura Hay, the Youth Peace Advocate” have become my favorite words. I’d like to say that I’ve grown up: that I’m super peaceful now and I don’t hurt anyone’s feelings ever…that I never get competitive and push people out of safety zones during capture the flag to tag them. But the people at the Missouri/Arkansas camp know that’s not true. This week I’ve struggled more than ever with the fact that I’m still human. I’m struggling to be more peaceful and to not let myself be overwhelmed by the little things. I wish I could just wave my “peace wand” and suddenly there would no longer be discord at camp. I still say the wrong things sometimes, but I’m getting better. I’m catching myself in times of harshness and trying to give people grace in theirs. I’m trying to be more honest and trusting of people. We like to think that keeping an idea in our heads or a hope in our heart, that things will change. But it’s a process and it takes action. I pray that I continue to practice peace in the days, weeks, months and years moving forward, and that I forgive myself when I’m not as peaceful as I wish I would be. I hope that in the future there will be more youth, eager to get sunburnt faces and sore muscles in the name of peace. My cheeks hurt from smiling, and I’m ready for peace. People who know me, really know me, know that when I’m truly touched by something, I go into what you could call a state of shock. I try to hide myself away and process. 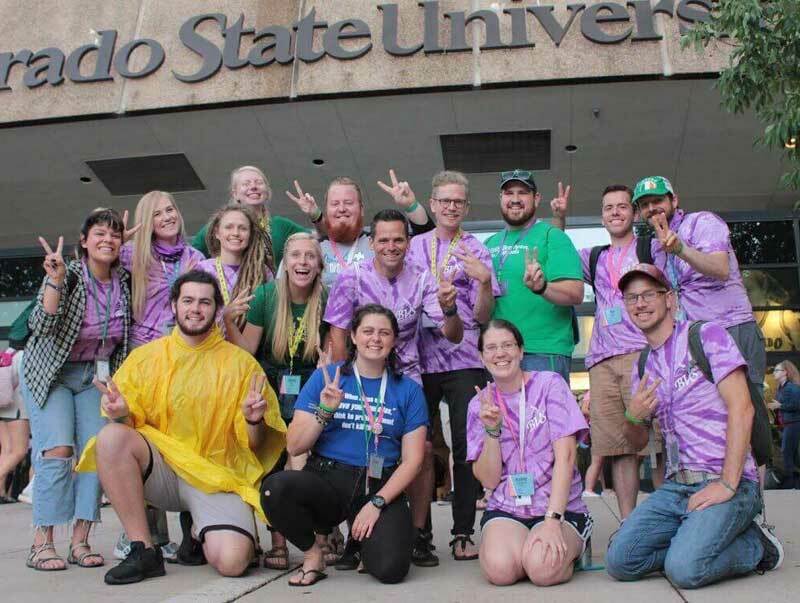 On Wednesday night of National Youth Conference, I did something I’ve never done before; I willingly walked into a room with a group of people after experiencing something important. I cried. Now I don’t cry often. If I do, you know something is really important to me. I cried, trying to hide my tears as I’ve taught myself to do. But I sat in a room full of people and listened to others. When I walked in, Jarrod McKenna was introducing himself to everyone and asking everyone’s names. And I must have had a stance of trying to still be hidden because he came over and, in a whisper, asked my name. When I have been impacted, in the way I was tonight, I get very moved by people acknowledging me, with a slight touch or a word. It just makes the tears flow so much easier. So when Jarrod McKenna asked my name and shook my hand that’s when the tears started coming. National Youth Conference is such a special place. I believe it is where the heart of the Church of the Brethren lives. It’s where people can truly begin to grasp what our mission is and who they are going to be within that mission. We are challenged together. We laugh together. We play together, and then we say goodbye. This is rare. I have participated in Jarrod McKenna’s alter calls twice now, and each time, most of the worship participants come forward, eager to say they will be a rebel for Christ too. And every time, he warns against just following the crowd. He respects those who do not come forward and so do I; it shows that they are truly thinking about the choice they are making. They choose the harder stance in the moment, but perhaps not in the long run. Big active calls like that seem easy in the moment. They are exciting and rousing. They make you part of a team, a crowd, a revolution – if only for that moment. To walk from your seat to the crowd takes barely any effort at all, but I believe all the people who came to stand in the crowd believed in what they stood for. Rebellion is hard work. It isn’t very glorious in most cases. We were literally called to be humble, to not seek the limelight – but to use a basin and towel. We were challenged to live as Jesus teaches through scripture. The Brethren way of understanding the Bible is often not how the rest of America understands the Bible, which can create an “us against them” mentality, which is counter to Jesus’ teachings. What if we truly acted as if we were on everyone’s team? We were challenged to live by the towel and the basin. When we are confronted by another and find ourselves feeling combative and vilifying each other, we must remember that “we wash feet.” That’s who we are. After the service, like I said, I walked into a room with other people. Those were the people who were called to come talk more about their feeling of call. “Call” is a hard word to describe if you haven’t felt it, but I think most of us have in some way or another. What if we listened more intently for our call? In that room were 15 people who felt a call to have a discussion about what they were feeling. It wasn’t a big call but they followed it. What if we took even a small step towards our call? Many felt like their call was too big. It seemed like their whole world was changing…and hopefully it will. Perhaps this change happens by traveling somewhere else, by finding developing countries in which to wash feet. But maybe it is just as world changing to wash the feet of your classmate, or to love the man down the road who lives alone. It felt like some in the room wanted to be Superman. I get that. But what if we changed our personal world before trying to change the whole world? People in this discussion also expressed a longing for community. I get that. I’ve talked a lot about loneliness this summer. It’s not something I thought would relate to the subject of peace, yet I have found that it does. Finding the people in our communities who will help up on our journeys is tough work. I haven’t found a whole lot of them to be honest with you. Sometimes being a peacemaker can be lonely. But guess what?! We were just at a conference with at least 1,000 people who felt the same way. What if we gave other people the connections we long for? We need YOU to hear what has happened to not let it fade! Let the stories from NYC be a spark which ignites the Christ light in you. Let Christ’s light propel you forward! Let Jesus’s Gospel train barrel down the tracks, until that train is packed full of the people who want to join God’s mission. Packed full of the feet that you and others have washed. Packed full of people who have become peacemakers. Packed with those who have learned about what it means to truly follow Jesus. Everyone can board our train! Let go of your fear of being seen, of seeming odd, of being misunderstood, of being the outcast, of being weird. You will be weird. Good. Jesus was weird. To be or not to be? To answer the call, to take the challenge, or to choose a more simple, less intimidating path? A week before beginning my journey as Youth Peace Advocate, I was terrified. I was mortified at the prospect of traveling the country alone, talking about a subject I wasn’t sure I knew how to address, and feeling as if I wasn’t worthy of the task for which I was called. 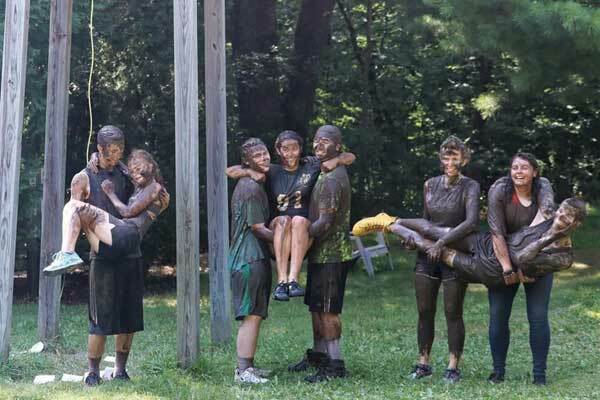 At “senior campfire night” at Camp Emmaus, every student stood up and said something very similar – about at first being afraid to come to camp, but as soon as they arrived, having those worries relieved. When I was packing up my room I found a box of temporary tattoos. I had gotten them at the Oregon Shakespeare Festival before my freshman year of college, and there was one tattoo left in the box: “To be or not to be?” It went on jet black and crisp; it almost looked like a real tattoo! The words were edged on my left shoulder blade and it felt right. I didn’t think of it at the time, but it was a question I had been asking myself 500 times a day since accepting the call to be the Youth Peace Advocate. To be or not to be? (I’m a little angsty, but you know what, so was Hamlet). These tattoos usually last between 1 and 2 weeks. Believe me, I’ve gone through a whole box of them. But this question seemed to linger, staying planted on my left shoulder blade and in the back of my mind. To be? Can I do this? Is this a call I can handle and will be valuable for others? Or not to be? Who would I be if I let my anxiety about it take over? In the first weeks, I had to learn that being the Youth Peace Advocate is different than being on the travel team, and I was going to bring different things to the camps. Maybe I haven’t brought the high energy skits and songs or the funny anecdotes that people might expect from the Youth Peace Travel Team. But I did bring other things, and I know that is different and valuable in itself. This week, my temporary tattoo washed off and with it, the question. Camp Emmaus has felt loving, accepting and is a safe place to express vulnerability. Seeing the seniors be so vulnerable in their stories and seeing how much this place effects their lives was a moving and inspiring experience. Maybe that is a reason I feel brave enough to share this struggle with you. I feel safe. I may not have anything profound to say this week. I’m not going to try to tell you how to be Brethren or the importance of peace or even the sequence of events that happened at Camp Emmaus. Instead I’ll tell you: I know the answer to my question and it has taken me as long (or longer) than the magnificent seniors here at Camp Emmaus. And the answer is this: Be. Follow the call. These campers have found a safe place where they feel heard and honored, and they have learned how to gift that to others. They gifted it to me! Follow the call. The senior highers have found an amazing home here at Camp Emmaus, and although I haven’t been here nearly as long, I feel like I’ve gained a permanent home outside of a little town named Oregon, Illinois. Even if I never get to come back, the mark that this place has made on my heart is far from temporary.